Some of you may be aware that I have had issues with my new machine as of last December not liking to quilt silk thread. It was first detected in about February, and I was so busy with other things that I didnt give it too much thought. Recently, when I was quilting my show quilt, and thinking I'd do some background fill in silk, it reared its ugly head again. I futzed with it for nearly 8 hours over the course of a couple days. My local rep's tech person who has done the servicing on my old machine for 7 years came to visit last Thursday. After nearly 4 hours, he couldnt get it to run reliably. I was starting to feel pretty frustrated. Not quilting silk is a definite deal breaker for me since my personal quilts use a ton of it. Handi Quilter corporate got involved, as they should. Anybody that knows HQ knows that their people are just fantastic. I tried again to trouble-shoot for a day or so with their advice and suggestions. On Friday, we decided that sending the head back to Utah for their top techies to look at it was best. That is why the machine you see has all of it's "stuff" (handles, lights, laser, etc) removed, and awaiting another strong arm to get her into the big padded box. With any luck in 2 weeks, she will be back and I will be onto those client quilts that seem to have slipped behind. It is most unfortunate that my kids have 3 more weeks of school. This is total crunch time for me. Learning of the machine's fate on Friday, I had to burn the midnight oil this weekend to get my client's Roseville quilt finished. It was partially ditched when all the troubleshooting began, and came off my frame 3 times last week. Lucky for me, I had a good plan of what I wanted to do, so after the ditching was done, the fills were fairly straight-forward. I cannot imagine how many months my client spent appliqueing this -- it is absolutely phenomenal. Her applique is very clean, not a thread to be seen. There is no excessive thickness like some appliques have either. There is certainly no excess of space for creative designing on my part, but I added simple frames and dense fills to pop the lovely applique. One layer of wool batting is all it takes for this type of loft. 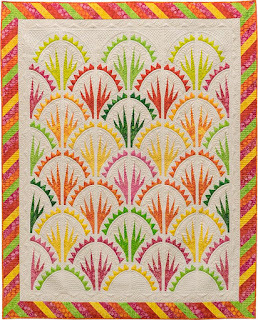 This freehand-feather filler is great for small backgrounds, and it fills in beautifully and quickly. The center has so very much applique. And have a look at this insane embroidery...How many knots are there?! It was a little challenging to quilt around, but hopefully looks ok. I went a little lighter on the quilting here since I had to use the 40wt thread. Thank you machine, I would have much preferred the silk thread! The colors are simply yummy - it is a truly gorgeous design and execution. Some appliques were of a size that required stitching on them, but I always just try to keep this simple. The next two weeks will be a diversion so I can deal with future teaching gigs, class prep for upcoming teaching, and finishing up a new book on the borders designs. It all sounds so officebound. Maybe I will get some time in on this small quilt I have started. These 4 star-dresdens are done, and there are 5 more needed. It's most likely a pipe dream thinking this can possibly be done before the December Paducah deadline, but this girl is still dreaming just a little. Have a fun quilty week! 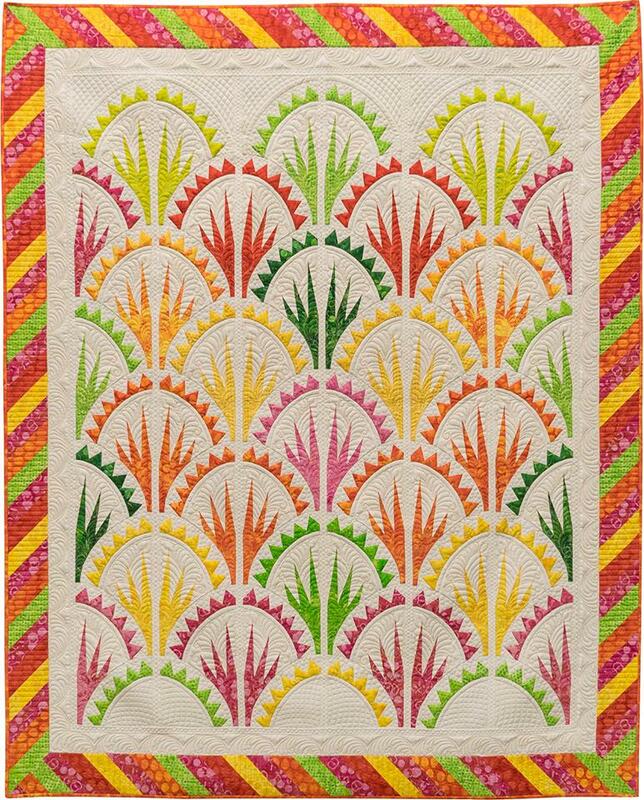 This totally great new Neimeyer quilt is by CI Jackie Kunkel. I thought I was going to have to wait to show it for another week or so until its unveiling at spring market, but when she posted a photo today, I knew it was safe to show. I quilted it for her in December, and it is probably my favorite of all quilts I have quilted for her. The colors are just yummy. But then you already know I love lime green and orange! It has a wool batting and is quilted largely with a peach YLI polished poly thread. Pure white areas have white thread, but in person it has a pretty colored thread that shows, ever so faintly. Sorry, this is sideways, but I'm not patient enough to try to turn it. I custom designed a feathery motif for the area beneath the clamshells. This saved me from actually ditching all of those spikes. I think it gives the quilt a pretty and unexpected flow. Don't get me wrong, there was plenty of ditching done around all the arcs and triangles. Otherwise they wouldnt have been so crisp. I love designs like this because though there is a lot of stop and start, it does fill pretty quickly. The white border has a pattern I also designed and happen to really like. It is first quilted with the clamshell/semicircles, then the echo, and then the feathers last. Gotta take advantage of even the smallest real estate...this was a 2 or 3" border. And it seems that this just is not my day because this one is upside down too! Go figure. Time to go putter on my own quilt, which is going at the pace of a dead snail. Nice to know few things change! Time does fly. My kids will be out of school in 6 weeks and the crunch is here. As much as it feels like I work, there is always more. Should have been born male so when 5pm comes, I can just do nothing. 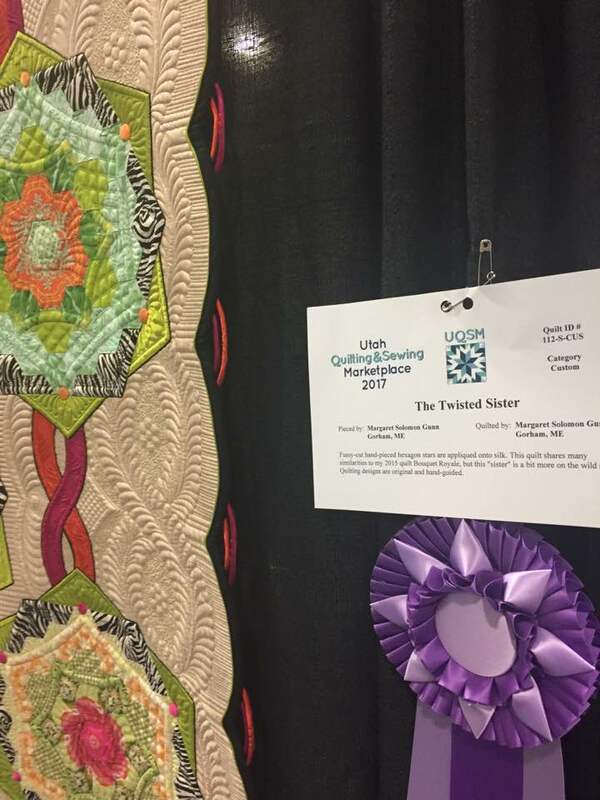 The biggest news is from a quilt show in Utah. The show that used to be called HMQS (its now UQSM) is right now. I have 2 quilts there, and they have outdone themselves. These are my newest finishes from late last fall and this spring). One took 1st place in its category, and The Twisted Sister has earned her second Best of Show! 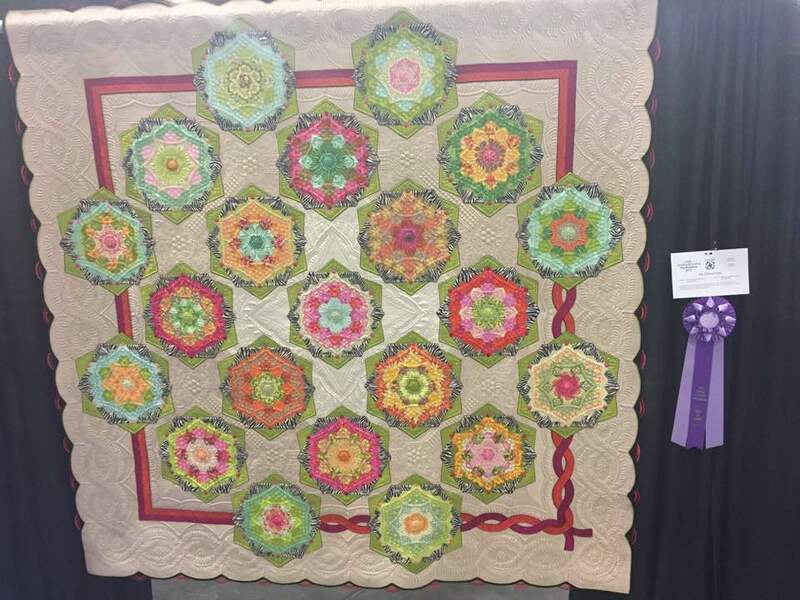 I was so excited to hear that this quilt did so very well. These are someone else's photos borrowed from FB because I am not there. Back in cold, wet Maine...I spent a week puttering. That's code for "little of this, little of that, lotta nuthin". I have a book in the works that may or may not be done later this summer. At some point I must switch gears and start prepping to teach in July and September. It still feels like there is a lot of content I need to tweak and prep. Here's a sneak peek at one of a couple new class samples I have done on border quilting. I need a drone/clone that can just do all the things I think I need doing while I go take a nap. I have a couple dozen borders still to draw. Go, clone.. The extra body in my house is going back to work Monday. It will be SO nice to have my work space to myself again. I spent time yesterday starting to quilt this quilt... It is my next quilt, but don't get any ideas you will see it finished before next April. This is the usual time I start quilting for an April finish, sigh... I have just reached the 1/2 way point with the ditching. I'm going to say this here, again. I am sharing photos of this process so my readers can see them. This is NOT something I particularly want you all to just copy and plaster on your facebook or pinterest. Please don't. This is my personal intellectual property. It's my design, and I'd like it not taken or copied before I finish. Thanks. The backing is just amazing flower fabric. No boring solid backing this time (even if it does show off the quilting better! ).